1 photograph : b&w ; 8.9 x 12.6 cm. 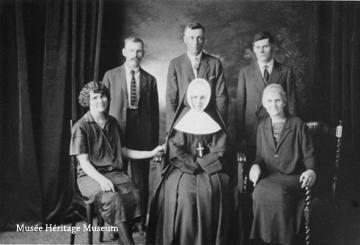 This photograph depicts a studio portrait of members of the McDonald family. Standing in the back row, from left to right, Alexander, Romey, and Angus. Seated in the front row, from left to right, Tena [Christina], Sister Jeannette, and Sarah McDonald.